According to police , the two thieves were involved in stealing computer and other items from Government Higher Secondary School, Ruksin during the month of February last. 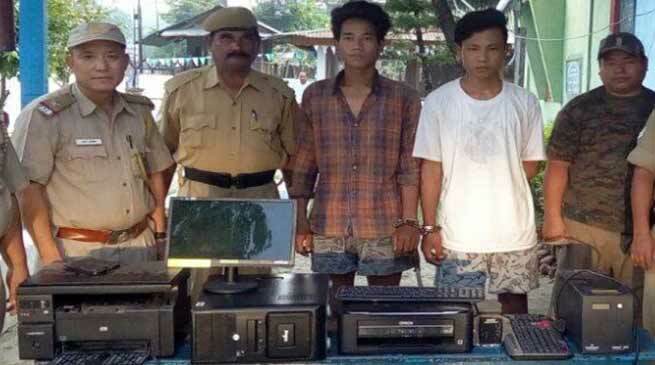 “After registration of the case at Ruksin PS against the burglary, the police launched a thorough investigation and zeroed upon identifying one Tony Koyu of Jonai (Assam) and Penam Tamat of Sille-Oyan, Arunachal Pradesh following which the duo were arrested. Meanwhile, police has also alerted all the police personals under East Siang to be proactive in protecting the public properties and interest while making no compromise on duties as without the role of police any society will go lawless. At the same time, police also appealed the common public to be cooperative to police while discharging duties so that public properties and proper law and order could be controlled or maintained.